Google’s (s goog) Chrome browser and Android mobile operating system went public in the same year but they haven’t converged until now. 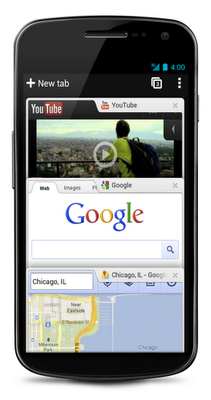 Google is finally introducing Chrome for Android, a beta which is limited to Android 4.0 devices. The fact that Chrome will be limited to just about 1 percent of Android devices is a disappointment, but we should see Chrome proliferate on more smartphones and handsets as devices are upgraded to Android 4.0 and consumers buy new Ice Cream Sandwich hardware. The Android version of Chrome features a re-imagined tab system, fast browsing using one finger flicks and auto complete for searches and URLs. Chrome will pre-load sites it thinks you may visit. And there’s also a new system of previewing links by zooming in, making it easier to click-through. Because its connected to a Google sign-in, users can get their personalized browsing experience transferred to their phone. That means you can see open tabs and synced bookmarks from the desktop version transferred over to Android. There’s also support for incognito mode so cookies and other data are not saved during a session. Chrome will not handle plug-ins including support for Flash (s adbe). The plan all along was to bring Chrome and Android together but Google found it tough to pull off. It finally made a breakthrough with the combination of the improved software in Ice Cream Sandwich and better hardware. That makes it unclear how many older Android devices if any will be able to get the Chrome browser. Google made do with a stock Android browser, which got smarter over time but it was never appropriate to call it a Chrome browser because it wasn’t based on the open-source foundation of Chrome. Now, Google has a much more robust browser that can compete against third-party browsers such as Dolphin. And Google has a better way to position Android against iOS and its Safari browser. This could also eventually provide a boost for the desktop version of Chrome, which is growing quickly but still trails behind Explorer. For Google users, this is a good reminder of why it’s helpful to stick with Android. Android users with Ice Cream Sandwich can download the browser in Android Market. 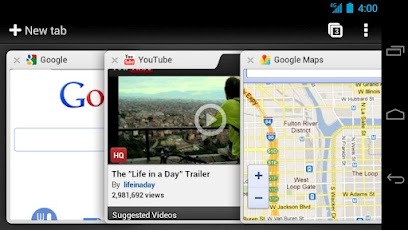 Google plans on baking the browser into the operating system for upcoming Android 4.0 devices in the coming months. It’s nice to see Chrome finally make its way to Android, more than three years after the two debuted. It’s going to have limited effect initially because of the small footprint of Ice Cream Sandwich. But it shows that Google still has ways to keep improving Android and make it even more polished and usable, a big priority with Android 4.0. IOS (s aapl) users may not be swayed as much since iOS 5.0 provided some improvements to the Safari browser, including Reading List and tabbed browsing for the iPad. But overall, it’s a good sign for consumers that they’re getting more robust browsing experiences on mobile devices, which is important as consumers spend more and more time accessing online services from their smartphones and tablets. That makes it sound like the browser cannot handle Flash plug-ins, which is untrue if you install a Flash player. What world do you live in? The Android browser does support Flash. Thanks, fixed it in the story.